My 4 year old son, Tej’s food has been something I have put a lot of thought into over the years. Considering getting kids to eat healthy food is something that’s top priority for any mom, thought of noting down my observations and experiments with trying to get Tej to enjoy healthy food. I feel that the one thing common to all kids who eat healthy foods is that they think that is how food is meant to be. Vegetables are a part of their everyday meals and that is all there is to it. Think about it this way. Imagine you are a part of a group of people that lives in a forest. There are no fancy restaurants, no glitzy malls, no fast food. What would your kid eat? Berries, roots, fruits, meat, fish .. whatever the forest provides? Would the kid throw a tantrum? Certainly. Somedays, he or she might say ” I don’t want to eat this tonight”. So you say ok. You offer something else but you offer another kind of food that is also a healthy option!! The kid is happy enough to accept it. Why? Now I fully appreciate your difficulty with the above situation. You are not a forest dweller. You live in an urban set-up with all its trappings. So what do you do then? The answer is that you can still behave like a forest mommy to some extent. By this I mean, our urban kids will of course have their ice-creams, chocolates, chips, cookies, pizzas, juices (yes juices too are sugar loaded mostly and without the all-important skin) and other inventions designed to make us drool. But, these things can be impressed upon as being treats! And treats cannot be had everyday. Not even every other day. Every time you wonder what to do when your child doesn’t eat something, think what a Forest Mom would do. Tell yourself that you only have healthy alternatives. It is far too energy-consuming to convince an unwilling child to eat. And meal times then become stressful for the mother and child. Not having to run after the child is not only good for the mother but the child also learns to listen to his body. Obviously for very young children, they are not capable of telling you when they are hungry. But even the tiny ones will co-operate when they are hungry. If children are sensitized from early on to the fact that they are the ones to drive their meals, they will learn to say “I am hungry”. Tej started saying that by three years. The mom only needs to keep checking with the child if he/she would like to eat. Most mothers are not ok with children not eating at designated meal times. I feel we need to look at it like we look at the sleep times of babies. We don’t force babies to sleep at a particular time. We gradually work at it. Similarly, we can work on kids eating at the same times as adults but not force the issue. If you can start your child eating normal food early on, and not just baby food, it helps. By the time Tej was one year, he was eating regular food that was cooked for us at home. He didn’t have more than a couple of teeth at the time, but we managed. If you have to keep cooking foods separate to what the family eats, it gets very tiresome. Also luckily in my house no one likes spicy hot food so all our food was child friendly. Usually even while cooking for kids, we try to cook things such that they are tasty to us. We sprinkle salt or add sugar or honey and we find food without salt or sugar unpalatable in most cases. My way around is usually to add fresh fruit or dry fruit. For example I add black dates to his oats porridge instead of sugar or honey. The egg I make for him is without salt. He loves ghee and home made butter and butter milk. But I do avoid buying salted butter (like Amul). Also I have recently discovered that most store bought foods do contain sugar and salt anyway – for example bread, cornflakes, even though the cornflakes I buy are the most basic with no flavour. Cheese has a lot of salt, the rotis we make at home usually contain salt. All in all, it is better to reduce the salt/sugar in the child’s diet. Apart from being good for the health , it also helps to develop a fuss-free palate, as the child does not really care much for salt and sugar in his/her food until he/she is taught to. Sometimes when he doesn’t want to eat something on his plate, I use colours to my advantage. If he has pointed to beetroot, then I will ask him about all the colours on his plate – daal – yellow, veggie – green , beet – red. So I tell him – They all have different colours because they give us different kinds of strength – some are good for the eyes, some for the legs, some for the brain and so on. It usually works. Of course, it means not overcooking the veggies and cooking the food without too much masala/spice so the veggies look nice and green. care of. Also worth noting is that he eats all fruits as they are – no dressing. My husband, Harshad, played an important part in this one. When Tej was little I would tend to remove the apple skin (Tej took a long time getting all his teeth out). Harshad would insist on giving it whole (Forest Dad into Action). I would often argue that apple skin is tough but he persevered and so did Tej. Anyway the end result is that Tej eats all fruits as they are meant to be and fruit shakes/juices are rarely made! I must also mention his milk drinking here. He has his milk plain – no sugar, cocoa, bournvita etc. The reason I give it this way is because, again, I want him to appreciate the taste of milk as it is. And he loves it. Also, I give it straight from the packet, that is without boiling it, as it tastes much better that way ( and yes, I serve it cold). As long as it is pasteurized, it is perfectly safe to have it without boiling it. Most people are not ok with giving unboiled milk to a child but again luckily for me, Harshad was all for it. Also, the rest of the family enjoys milk the same way and I think it has contributed to Tej liking milk. He does have these periods when he doesn’t want to drink milk but I don’t force him to have it nor do I flavour it to try and get him to drink it. I just wait it out and he usually comes around in a couple of days. The TV ads make a big impact in this regard and do their best to convince you how your child will love drinking milk because of their product and also make him stronger, taller, faster, brainier too!!! I mean really?!! I do have friends who ask me if it’s wise to not give him these products. If you ask me, plain milk is the better option. According to Tej’s paediatrician, if the child is healthy, active and plays outdoors, there is no need for any supplements of any sort. 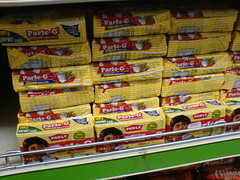 Also, because the taste for plain milk has not been developed, there is a life-long dependency on these products. nutritious items you might have on your mind. Also, because biscuits taste good and make the child feel satiated quickly, he will ask for them everyday. As they grow older, they will eat as much quantity as they need at the time. Soon it becomes a habit and one of the snacks during the day is biscuits. When kids wander into the kitchen or they see something on the dining table, they sometimes pick it up and stuff it in their mouths. When Tej does that, I let him, even if it is close to dinner time.You might believe it spoils their appetite, but in the long run it does more good than harm. The only thing I keep a check on is the quantity. Since I never have any junk food lying around, there is no question of him gorging on a packet of chips or anything. So at any time he feels like, he comes around and picks off a banana or peas or carrots or dry fruits. Of course when close to a meal time, it is my cue to quickly lay the table for dinner. I believe it is good to keep rules about food to a minimum at least in the child’s eyes. Apart from the fact that Tej eats everything, he is also very open to new foods. This is mainly I believe due to having my husband involved. Most women are the sole show-runners as far as their childrens’ meals are concerned. And we unwittingly sometimes hand over our own food prejudices to our children. It helps to have another, preferably male perspective to the thing. For example, we tend to associate certain food with either allergies or other sickness and hence we tend to say to our kids “Don’t eat this now when you have a cough/cold/etc”. Harshad would always intervene and tell me to let him have whatever it was – usually some fruit which I feared would increase his infection. His logic was that “there is no proven scientific study which says that this fruit will increase his infection. So don’t hand over your prejudice towards that fruit to him.” Also, we often say “don’t eat this when you have just eaten that”. Or, we often feel that a certain thing must be eaten a certain way – for example, you have to add milk to your cornflakes, or dal must be added to rice and so on. Tej would sometimes make some weird combo at which I would look with distaste but Harshad would insist on letting him have it his way. I think in hindsight it definitely helped him to treat food as something fun and something to be experimented with and tried out. We were going hill climbing the other evening when I asked Tej what he would like to eat at the top – a tomato or a banana? He went with the tomato. My sister repressed a shudder when she saw him munching on the tomato after we had climbed up. “Why have you given him a tomato? I can eat it in a salad but like this?” she asked me looking as though she felt queasy at the very idea. But I like to have Tej try the same food in different ways. That way he is open to new ideas about how the food can be presented. I normally slice his boiled egg but sometimes give it to him half peeled so he can hold it in its shell and munch his way down. The basic premise behind all these ideas is “Treat treats as treats!“. 1) Classify things that you think should go in to the treats category. Also, don’t think – “What ! The poor child can’t even have a biscuit now?” There will be plenty of occasions for treats, especially if you live in India. And don’t forget to convey what you have classified as a treat to other family members. 2) Treats have to be rare, else they become meals! If a child knows that she can get biscuits anytime or can demand jam on her roti instead of subzi at any meal, it’s unlikely that she will think of it as a treat. Once a habit is formed, it is extremely difficult to undo it. But it’s ok. Just stick to the basic plan, which is to reinforce the idea that meals and treats are separate. Also, it’s important that the mom doesn’t get stressed out about the child’s food. Quite the opposite. Just think of healthy food as fun and hopefully the child will too. My F-I-L jokes that youngsters should be able to digest even stones. And I have kind of adopted his philosophy – so I try to not get worked up about what he eats, when and how much. Also, these ideas are meant to be a work in progress. As Tej grows older, we will have to re-visit some of the things and do something new. I don’t know what kind of food habits the adult Tej will have, but I hope he keeps enjoying healthy food options without thinking it to be a bore. Do add your comments and share your thoughts. You ignore Nutrilite for Tej??? I hope you strongly consider. Come on! !